Curated for Beauty. Crafted for Life. 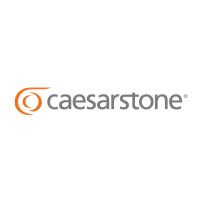 Caesarstone is a leading manufacturer of premium quality quartz surfaces. Established in 1987, the company pioneered high-quality surfaces utilizing advanced technologies and expertise. Caesarstone continues to lead the industry with new trends and colors of high quality surfaces consisting of up to 93% quartz, they retain the cool tactile qualities of nature's strong stones with enormous application possibilities including kitchen countertops, bathroom vanities, wall paneling, furniture and more. Caesarstone offers a product that is highly functional, design forward and beautiful. The unique and rich variety of colors, patterns and textures enable customers to find their 'ultimate surface' and create their own unique space.